Eliminates ad and tracking cookies. Is there a better alternative to Cookie Stumbler Basic? Is Cookie Stumbler Basic really the best app in Internet Utilities category? Will Cookie Stumbler Basic work good on macOS 10.13.4? 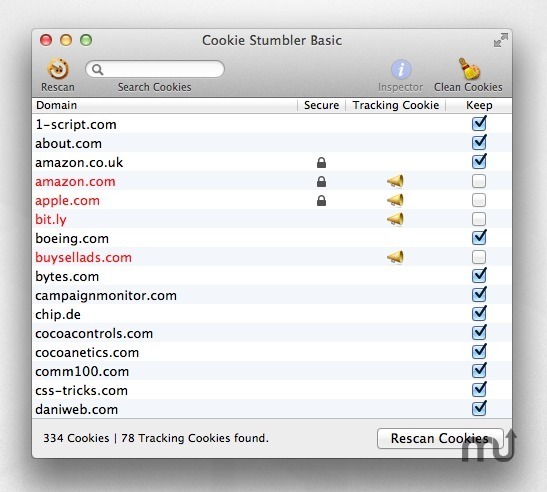 Cookie Stumbler Basic eliminates Ad & Tracking cookies and allows you conveniently to maintain only the cookies on your computer which you really want to keep. This eliminates threats to your privacy and helps your Web browsers to run faster. It will recognize known Ad/Tracking cookies via built-in definitions and so far unidentified Ad/tracking cookies via an intelligent heuristics engine. Cookie Stumbler Basic isn't dependent on advertising companies to "allow" users to opt out as some other applications. It does its job independently and it will do so without interfering when you browse the web. Note: The downloadable version is 1.2.2. The Mac App Store version is currently 1.1.2. Please note that Cookie Stumbler Express is now discontinued. Cookie Stumbler Express users can upgrade to Cookie Stumbler Basic for free, provided that they send us their iTunes receipt confirming the purchase of a Cookie Stumbler Express license.